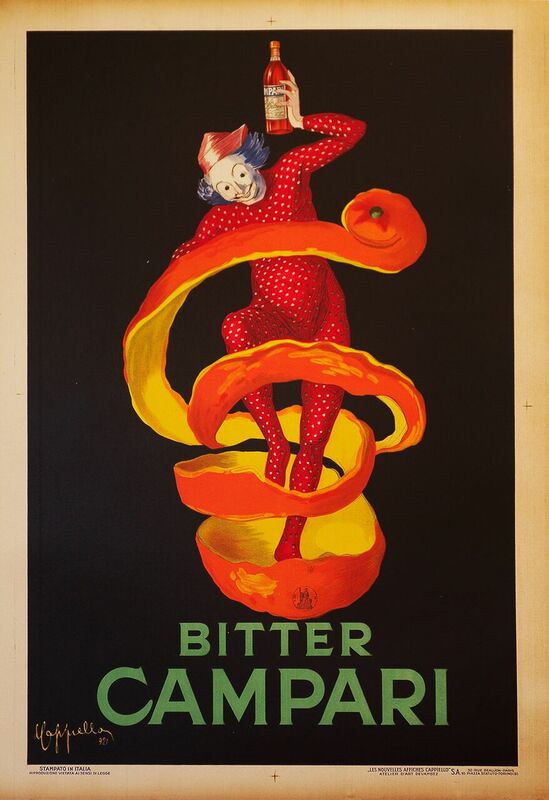 The Bitter Campari Poster by Cappiello is one of the most recognizable and enduring images in all of marketing and poster history. Cappiello used the famous theater character Pierrot, a lonesome, pallad-faced clown, to create in image of whimsy and fantasy for the famous, working-man’s brand. Pierrot stands out in his Campari-red jumpsuit, not to be overshadowed by the larger-than-life orange peel, the drink’s delicious companion. The mixture of colors, movement, size, and depth, turn a very simple concept into an extraordinarily successful and alluring design, so much so that the image was used by Campari for over five more decades.